Superstructure's XLG framing system provides a superior solution to your advertising needs. Custom made to your specifications, these slim yet solid aluminium frames are available as stand alone, wall mounted, suspended, pole supported and as backlit units. 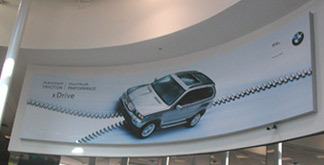 XLG is easy to assemble providing "wrinkle free" graphics and adjustable tensioning.